Bruce Johnson holds a 22-inch smallmouth he caught near Conley Bottom on Lake Cumberland. Lake Cumberland, Laurel River Lake and Dale Hollow Lake hold some of largest smallmouth bass in the world. A look at the surface of Lake Cumberland right after dawn reveals a big, calm lake. Although the old Cumberland River now lies under at least 100 feet of water throughout most of the lake, the old river is still churning. Water quickly finds weakness as anyone with a leaky basement can attest. The water in that long flooded river channel wiggled and shimmied through the porous rock at the base of Wolf Creek Dam for decades, necessitating a drawdown and repair beginning in 2007 and ended last year. During the drawdown, saplings, bushes and other vegetation sprouted on the former lake bottom. This vegetation is now submerged, providing habitat for young sport fish, food for baitfish and ambush cover for predator fish such as the burgeoning population of smallmouth bass in the lake. Bruce Johnson, of Richmond, grew up fishing and exploring Lake Cumberland from the back of his grandfather’s farm along the West Fork of Indian Creek. Last Saturday near Conley Bottom, he caught a 22-inch smallmouth bass, his largest ever. John Williams, southeastern fishery district biologist for the Kentucky Department of Fish and Wildlife Resources, said the lake now holds more smallmouths longer than 20 inches, the minimum length to qualify in Kentucky Fish and Wildlife’s Trophy Fish Program. Fall, winter and early spring are the best times to fish Lake Cumberland or any of Kentucky’s other world class smallmouth lakes such as Laurel River Lake and Dale Hollow Lake. Some of the largest specimens in the world swim in these lakes. Sloping banks, like the one that produced Johnson’s fish, are the places to fish now with water temperatures on these lakes hovering around 60 degrees. Live alewives, shad or shiners bottom fished on a slip sinker rig with a 1/0 circle hook work well. Shiners rigged through the nose on a size 1 octopus style hook and cast onto these banks produces many fish. Place two BB-sized split shots about 18 inches above the hook. Circle hooks are fine for still fishing, but for casting live bait, the octopus style hook works much better. Long sloping points also hold big smallmouth bass in fall and winter on these lakes. Trophy smallmouth suspend over these points, waiting for schools of shad or alewives to cruise by and provide dinner. A 3-inch pearl Slider grub fished hook exposed on a ¼-ounce ball head is deadly in this situation. Start fishing well off the point and count the lure down in the water column. Points formed by a creek or the old river channel are best. Retrieve the lure with a slow and steady cadence until you feel little pecks and nips from small fish. Count the lure down a little deeper and retrieve in the same manner. Eventually, you will hit the zone of actively feeding smallmouths. This method produces large smallmouths in late fall and early winter. You can repeat this pattern throughout the lake on similar points. On Laurel River Lake, the sloping banks and extended points around Hightop Boat Ramp in the Laurel River arm of the lake, in the lower sections of Spruce Creek and the long points near the dam are all excellent places to try. Williams and crew sampled some nice smallmouths in the Illwill Creek arm of Dale Hollow Lake recently. The sloping banks and points in lower sections of Illwill and the Wolf Creek arm hold smallmouth bass as do the channel points near Phillips Bottom. Any sloping bank or extended point on Lake Cumberland from Fishing Creek to the dam produces smallmouth bass in late fall. Fishtrap Lake in Pike County is a sleeper smallmouth bass lake with an improving population of fish up to 22 inches. The lake undergoes a severe drawdown in fall, making the lower section of the lake from Hurricane Creek down to the dam the best section to fish during the cold months. Don’t let the fall winds get you down. They are blowing in the reservoir smallmouth season. Editor’s Note: Author Lee McClellan is a nationally award-winning associate editor for Kentucky Afield magazine, the official publication of the Kentucky Department of Fish and Wildlife Resources. 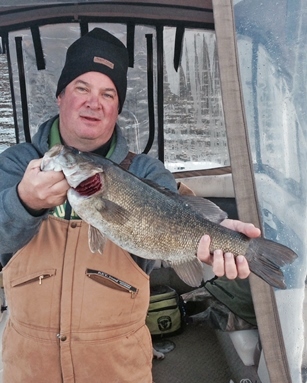 He is a life-long hunter and angler, with a passion for smallmouth bass fishing.